Why are retainers required after orthodontic treatment? One important component to having your orthodontic treatment completed successfully for years to come is wearing your retainers. Your teeth following treatment have been pushed and guided to a new normal position following tooth movement. The entire process is an equilibrium between bone resorption and bone apposition and because of the fluidity of this process teeth are exceptionally prone to relapsing into their prior positions unless they are stabilised right away. How long should someone wear retainers? The first weeks following having your braces or Invisalign removed are critical in preventing tooth relapse. At the very minimum it’s recommended that you wear retainers full time for 6 months and then they can be worn at night for a minimum of 2 years. Sometimes we will bond a lower lingual bar retainer in behind the lower front teeth. With these you sometimes will not need to worry about using a lower removable retainer but we also recommend that they stay in place for a minimum of 5 years. If there is considerable risk of the back teeth moving we will also make a removable retainer to go over top on the lingual bar. 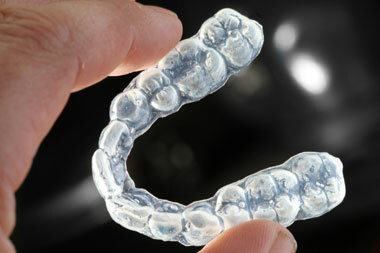 What do our retainers look like? As mentioned above sometimes we will bond a small lingual wire in behind the teeth, this is called a fixed retainer. Most other times we will use removable retainers. These are clear plastic trays that fit directly over your teeth. The advantage of these retainers is that they are easy to take in and out and allow you to floss normally. The disadvantage is that they can be easily misplaced and forgotten to be worn. The selection of retainers is individually based on clinical experience and projected patient compliance. How do I store and/or clean my retainers? For removable retainers what we do is make you a set of 4 retainers that are worn for 6 months each. When not wearing the retainers it’s best to place them in the storage box that we provide so they don’t get lost, i.e. the dog eats them! The retainers can be cleansed using your toothbrush, toothpaste is not recommended. For the lingual bar retainer we will provide you with a floss threader that you can use to actually get underneath the wire to floss between your teeth. Even so this wire is often a food trap so it’s quite common to get a little more build up in this area that needs to be removed professionally during your hygiene appointment. How long does it take to take to get used to retainers? For bonded retainers it only takes a day or two to get used to. For removable retainers they are very similar to Invisalign aligners so it will take no time at all to get used to them. If you had traditional wire braces then it can take a couple of days to get used to the extra saliva that Invisalign retainers cause. This excess saliva usually subsides after the 2-day period and the subsequent minor slurring of speech also subsides. Can I ever stop using retainers? Bone has the capacity to change anytime over your lifetime. That’s why if you break a bone it can heal over time. Even up to the age of 50 your face matures and can cause crowding of lower teeth regardless if you have had your wisdom teeth removed, extractions of teeth or previous orthodontic treatment for crowded teeth. For this reason it is suggested that you wear retainers indefinitely following orthodontic treatment. If you want your teeth to stay in perfect alignment as an adult you’ll need to wear retainers for the rest of your life. It may seem like it’s asking a lot but really it’s a simple way to make sure your smile lasts a lifetime! As per my experience i have seen cases with total relapse without retainers.